Deeply nourish hair from root to tip with Shea Moisture's Raw Shea Butter Restorative Conditioner; a weightless formula that works to hydrate, repair and detangle. Harnessing the powers of natural and certified organic ingredients, the conditioner combines Argan Oil, Sea Kelp and Shea Butter to help revitalise dry, damaged hair, whilst replenishing the scalp for long-lasting comfort. 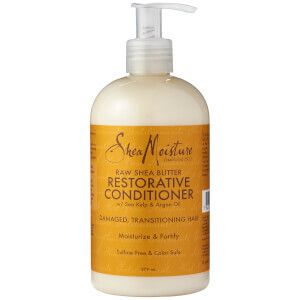 Suitable for use as a leave-in treatment, you can expect radiant, healthy-looking and moisturised locks every time. Water, Stearyl Alcohol, Butyrospermum Parkii (Shea) Butter***, Glycerin (Vegetable), Cetearyl Alcohol, Cetrimonium Chloride, Cetyl Alcohol, Simmondsia Chinensis (Jojoba) Seed Oil, Argania Spinosa Kernel Oil, Fragrance (Parfum), Glyceryl Caprylate, Olea Europea (Olive) Fruit Oil, Hydroxyethylcellulose, Sodium Lauroyl Hydrolyzed Silk, Panthenol, Daucus Carota Sativa (Carrot) Seed Oil, Tocopherol, Macrocystis Pyrifera (Kelp) Extract, Glyceryl Undecylenate, Sodium Benzoate.